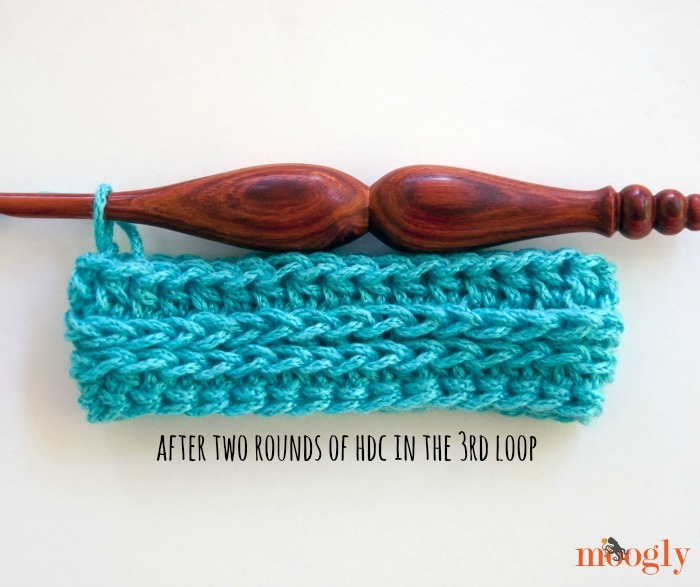 #Crochet Tutorial: How to Crochet in the 3rd Loop of the Hdc! The Ups and Downs Slouchy Beanie uses a variety of stitches, and one of them is the half double crochet, worked into the “third loop.” Where is this mysterious loop? Well, let me show you! 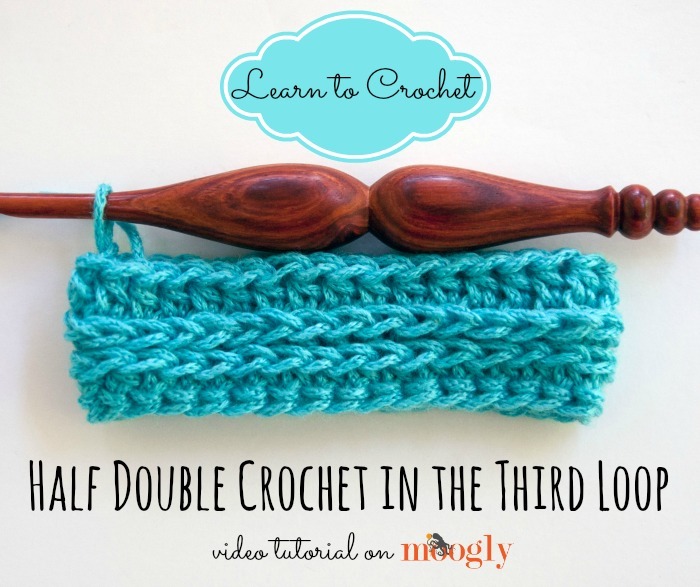 Here’s how to crochet in the third loop of the half double crochet! 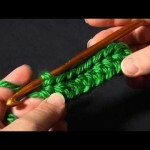 As you have seen in the video, there are actually two “third” loops in a half double crochet stitch. There are the two main loops – the V on the top of each stitch – referred to as the front loop and back loop respectively. 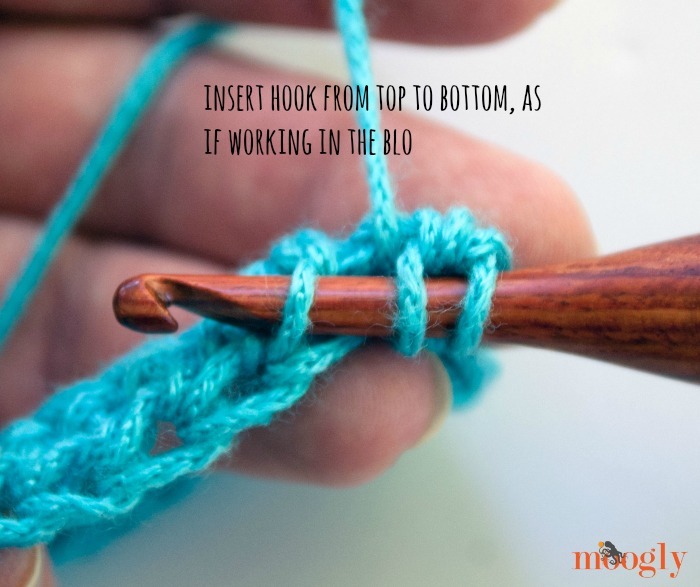 But that yarn over that happens before you insert the hook into the next stitch creates a third loop on each side of the stitch. And that’s the fun of crochet – so many places you can stick your hook to create a whole new look! 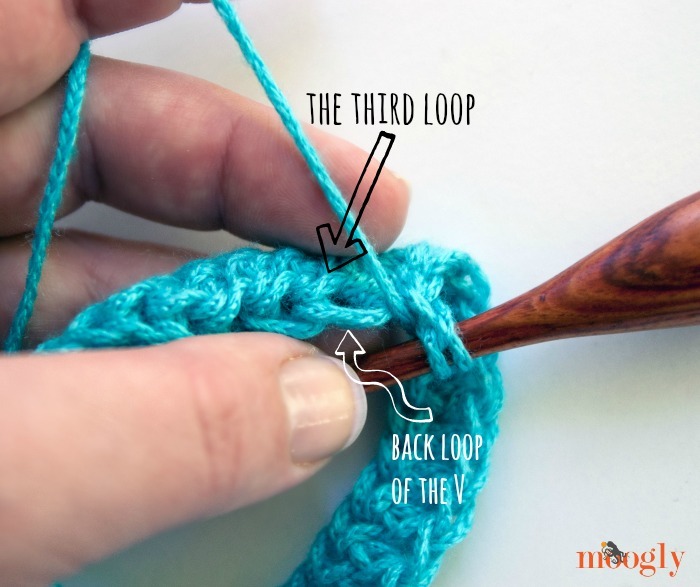 By crocheting into the third loop that is in the back, while crocheting in the round, you push the top V (the front and back loops) forward. 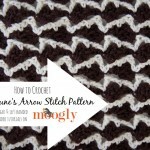 This can create a fabric that looks a lot like knitting! At least on the outside, or right side of the fabric. The third loop that’s in the front of the top V can by used to create this knit look fabric while working in rows – just switch between the front and back third loops. It still results in a fabric with a right side and wrong side, but the Vs will be pointing in different directions. Alternately, you work this third loop in rows as demonstrated on My Hobby is Crochet – her tutorial shows how to use this third loop to in rows to make fabric where the Vs all point the same direction! She’s also got a great tip for the joining when working in the round! Thanks for watching! Get more Moogly goodness in your life by checking out the social media links at the top of the page! If you’d like to advertise on Moogly, please check out the Advertising page. This is awesome, thank you! Is there a full video tutorial for the Ups & Downs beanie? 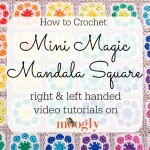 I think it’s great and want to make one, but I’m still kind of somewhat new to anything other than Granny Squares and I’m a little confused by the written pattern at the moment. Thank you Merryn! 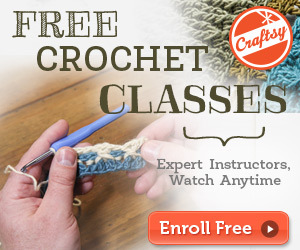 Not currently, though I believe all the stitches now have video tutorials linked within the pattern! I love your tutorials and projects. tHANKS FOR THIS VIDEO! WELL DONE! My favorite stitch in a new way for me 🙂 thank you! 😀 You’re welcome, I’m glad you like it Jessie! Is this the same as the Camel Stitch? Or maybe that is only when it is done with single crochet? Thanks–this is a timely tip for me! I believe that Camel Crochet is typically done with single crochet. Similar idea though! This helps with the beanie pattern so much! 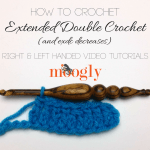 Loved yr video on the third loop half double crochet in back loop – wud u hv one for the front loop (third loop) – yr videos r easy to understand so wud like to follow yr video on the front loop (third loop). I enjoy yr videos b/c they r easy to understand – whenever I hv a problem I go to yr videos to find help. Luv yr designs & patterns as well. Tk u for sharing them & yr talent. I also mention to everyone about yr website & videos. Tks again for any help u can give me. I find videos easier to learn the stitches instead of diagrams. It’s me again. I shud hv mentioned that I did notice that u had a bit on th video for the front loop but it wasn’t enough 4 me to see. Wud u be able to make one for the front loop like u did the back loop. Many tks. Enjoy yr site & videos as mentioned earlier. Love these UPS and downs patterns. Thank you so much! Can you tell me where to join when working in the 3rd loop hdc? Do you join in a different place when transitioning back to regular hdc? Thanks again! Thank you very much!!! You are a fantastic teacher. Your explanations are awsome! 😀 Thank you so much Normajean! Thank you so much for the email reply. However I kept reading the written instructions and finally got it. But the video was also a great help to tighten the braids and help them look neater. also, the additional vertical braids video section was a good new technique also. So thank you again. Thank you so much for all your hard work in order we can enjoy crochet. Your videos are very hopefull. Really cool technique!!!!! Your tutorial makes it easy to follow. I have made 2 absolutely beautiful hats with pompoms for my granddaughter using this stitch. it works up so fast once you get the rhythm and the fabric that is creates is unique. Thanks. This is a neat idea. Love love love this tutorial and the 3rd Loop. It always fascinates me to learn a new anything – because creativity by others is astounding! 😀 Thank you so much Marny! Muito obrigado por compartilhar seus ensinamentos. estou muito agradecida e feliz! Awesome video! Very well done. Thank you so much! Wow, thank you so much Tamara, you are the best!! This has been a total mystery to me until you!! 😀 I’m so glad it helped! Thank you Arielle! I am using this stitch to make a border around a baby blanket. Could you explain how I would do the corner please? Hi Toni! It depends a bit on what sort of stitches you have in your corner to work into, but in general I’d recommend either working 3 sts in the corner stitch of the previous row, or working (3rd loop hdc, ch 2, 3rd loop hdc) in the corner stitch. The first will give a more rounded effect, the second will create a “sharper” corner. 🙂 I hope that helps!